Paul Tillich, the 20th century Protestant theologian, defined a symbol as something that points beyond itself. Symbols are unique mental objects which have no fixed referents. They can be contrasted with signs which have fixed meanings. Symbols are described as layered, multi-valent, multi-dimensional, or multivocal (Victor Turner's term). Their personal meanings and interpretations evolve to reflect the evolution of the individual, and the meanings of cultural symbols that are shared evolve as the culture changes. Symbols are complex because they have different meanings that change as they are explored. The figure of Christ has meant different things to different people at different times. For instance, Christ was characterized as a warrior during the crusades going into battle to defeat the unbelievers. In the early 20th century, he was characterized as a businessman and the perfect salesman and marketer, a union organizer and a friend of the working man during the rise of unions, and a strong athlete who could fast and control his desires through physical and mental discipline as preachers focused on the masculine virtues of Christ. Jesus is both the ideal capitalist and socialist depending on differing interpretations. In the early medieval period, Christian Neoplatonist's saw Christ as the logos or "divine mind". Here, God the Father was infinite being or awareness which supplied the light and power of creation. Jesus as logos was the set of archetypal patterns or templates that took this power and created the "world soul" or Anima Mundi realm where living things such as plants, animals, and humans came into being. The Holy Spirit was God's presence that infused matter and living things. These three abstract entities were "personalized" by later Christians, and became the basis for the three persons of the trinity. For many early Christians, Christ symbolized the divine intellect and salvation was attained through wisdom rather than faith. This abstract and universally creative function of Christ differed greatly from the incarnate Christ who served as the ethical model for the path to salvation popular in more modern interpretations. A final example of a modern interpretation of the biblical text says Christ was a symbol of abundance who came so his followers would "have life abundantly". In other words the gospels are at least partly about making people rich, successful, and happy. The power of making affirmations or doing positive thinking becomes a Christian practice (much like prayer) as megachurches show people a method to claim their spiritual inheritance of wealth, confidence, success, and high self-esteem. Sin consists of negative thinking and low expectations. The ministers, some of whom are multi-millionaires, become role models who claim to have the "spiritual" formula for success in the spirit of Amway salesmen. This formula often requires low and middle income people to send money to or "plant a seed in" the already fabulously wealthy church in the hope of eventually winning a spiritual lottery for themselves. They then become like the wealthy, successful preacher who has understood the true meaning of the Biblical text. Christ is characterized as the master of magical thinking (faith can both move mountains and bring wealth), and his charismatic ministers echo his message and method for obtaining both worldly success and other less tangible divine blessings. These examples all illustrate how broadly the symbol of Christ has been interpreted over time. Symbolic statements such as "Christ is the Light of the World", "In the beginning was the Word", and the necessity of having faith the size of a mustard seed also have different possible meanings and interpretations. Literal interpretation of such statements renders them absurd, and metaphor is a dangerous slippery slope that threatens those who believe the Bible or other holy book must be literally true. Symbols are dynamic as they grow and reinvent themselves. Symbols can be looked at as having a spatial dimension. As one layer of meaning is peeled away or shed, another comes into view from behind the first one. Symbols also have a volume dimension. They are receptacles that "hold" meaning and power for the individual. The more power they hold, the more they become holy and a focus for prayer and contemplation. As they gain power, they also provide motivation and inspiration for religious individuals and groups. A symbol is multivocal because it communicates different things depending on where the individual is on his or her spiritual journey. Symbols may be said to speak to people in much the same way that sacred scripture becomes like a living thing when religious people are able to enter into a kind of contemplative dialogue with the text. Symbols also have a vitality dimension. Symbols are in a sense alive. When a symbol fails to hold power, it becomes dead or meaningless. Religions can be looked as systems of symbols. Whole cultures evolve as newer symbol systems replace older ones. No one believes in the Greek or Babylonian gods any more. They are part of dead symbol systems (and therefore dead religions). Many of the symbols from mainstream religions such as Christianity and Buddhism derive from religious narratives describing the activities of founders of these religions and their disciples. For instance, the life of Christ is turned into a set of symbols in the Catholic Church's stations of the cross, which distill the major events in the life of Christ into a set of fourteen images. The Buddha's life is also captured in a set of images documenting his adventures in some Tibetan Thangkas, and the incarnations of the god Vishnu appear in depictions of the "ten avatars" in Hinduism. A charged symbol has power and is alive with meaning. Symbols may be charged spontaneously, and have power when first encountered. This often happens in religious conversion where an individual finds him or herself irresistibly attracted to a religious figure or symbol system, and converts to a new religion. Symbols may also become charged as an individual uses them in prayer and meditation, and directs attention and positive emotion towards them as part of a spiritual discipline or search. Such charged symbols can be very valuable when the individual directs attention towards them during spiritual travel. For secular or scientifically oriented people, or those who find their existing religion increasingly less relevant, the emergence of a living symbol often occurs after a period of meaningless where the outer world appears uninteresting or worthless, and offers no satisfaction or joy. Western religious people such as Saint John of the Cross also have periods of alienation where they wander in the desert cut off from God but perhaps find it easier since they may have Christian or Jewish faith that in the end, they will encounter the divine presence, and gain love and salvation. Using the more secular example, the psychologist Carl Jung describes how the person may enter the unconscious mind and experience pain and confusion prior to a psychological death of the old self which was fragmented by trauma. If the person is lucky, a (religious or mythical) symbol will emerge that brings about a spiritual and psychological rebirth. This brings about integration of the personality where the parts of the self which were split off are reclaimed and the person finds wholeness, wisdom, and spiritual depth. There are many descriptions of "the dark night of the soul", of Christ visiting hell for three days and emerging in a "glorified body" as a reborn spiritual man (or god), or shamanic descent into the underworld with the person being devoured by monsters, and then being reborn as a shamen who can guide and heal others. Most of these describe the emergence of powerful symbols that renew and spiritualize the person but here the emergence of a living symbol that causes a form of spiritual salvation comes after much pain, darkness, and struggle. If a living symbol does not spontaneously emerge and provide meaning to reorganize the personality, the person may descend into the unconscious and become psychotic and incapable of acting in the world. This is what Freud called the primary process where the irrational thinking and chaos of the id or instinctual self becomes primary and the ego as the center of the personality largely ceases to function. The external world recedes as the internal world takes over and overwhelms the person with negative emotion, conflict, and desire. So living symbols can be discovered during religious conversion experience, be created and nurtured through prayer, reading, and meditation, or emerge after a period of pain, alienation, wandering, and confusion so the person may have a spiritual rebirth. The spiritual traveler who consciously builds and empowers the symbol, and then carries it into the inner world to use it to gain access to the divine reality represents but one way to relate to living symbols. For the religious person, the act of contemplating scripture and religious imagery, and seeking to understand their various layers of symbolic meaning represents another method of empowering sacred symbols. But clinging to a literal interpretation tends to devalue and avoid this contemplative process. The existence of powerful living symbols can allow the person to endure much hardship and suffering. Dr. Margaret Coberly notes how concentration camp survivor Victor Frankl recognized the ability of a certain kind of prisoner to use visualization and the "loving contemplation of the image he carries" to overcome the depression that resulted from witnessing the brutality of a Nazi World War II concentration camp. In a similar way, as a Hospice nurse, she writes that those facing death can find peace and healing through to contemplation of symbols or sacred images: "Somehow, seeing a vision in the mind and reinforcing it with repetition brings it to life." (Sacred Passage, Shambhala Publishers, Boston and London, 2002, P. 37). One extraordinary thing about spiritual travel is that religious people who adopt a spiritual practice involving contemplative prayer and meditation do not have to wait until death to perceive the power of the symbols that they employ in their practice. They can get glimpses of the value and power of these symbols here and now which can be very motivating and inspiring. Contemplating a charged symbol while in an out-of-body state can be much like stepping into a whirlwind of powerful forces. Spiritual travel can access the power of sacred symbols directly and may even help the individual avoid the period of meaninglessness and struggle that often accompanies the emergence of a living or charged symbol. 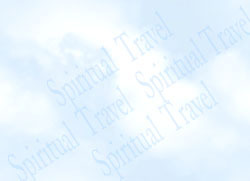 In spiritual travel, the individual can be picked up and carried to mysterious and extraordinary states of consciousness with the symbol acting as the method of transport. The symbol can function as the key that opens the door to a sacred reality. One trend seen in modern religion is the idea that there is one literal interpretation of scripture on which all reasonable people will agree. Passages from sacred texts are many times highly symbolic and multidimensional containing many possible interpretations. However, scriptures are being flattened and frozen into a single interpretation by authorities that know, for instance, what the Bible literally means. The other common levels of interpretation including the allegorical, ethical, and mystical interpretations are denied and suppressed. This approach is inherent in Protestantism as we see from the following quote from Martin Luther who is described as the arch-enemy of both mystical theology and the allegorical interpretation of the Bible. The first result of such an approach is that the authority of preachers who claim to know the correct interpretation is vastly increased. The twin doctrines of literal interpretation and inerrancy (the Bible is one hundred percent true, perfect, and without error) give vast authority and credibility to those professionals who preach the true word. The individual believer's power is in equal measure lessened. Of course this claim to literalism and the truth of every word in the Bible only goes so far since Luther totally rejected the line in the Bible (from James 2:26) that stated "faith without works is dead", and claimed it was a false doctrine in his writings. The second result of this concept of literal interpretation is that it leads to an over simplification of religion where only a short list of "fundamentals" are deemed important. This occurs because the same confidence that leads people to claim to know exactly what the Bible means also makes them certain that they know which parts are most important, which parts can be ignored, and what needs to be done to gain salvation. In this environment, simplified, stripped down religion tends to become a dogmatic formula. Here a personal relationship with the divine is reduced to uttering a prescribed set of phrases, which when spoken sincerely and correctly become a ticket to heaven. Salvation is achieved by religious conversion, which is, in turn, achieved by employing a simple ritual formula. When such formulas are treated like life preservers thrown to the drowning, they are grasped so tightly by the individual that they become an excuse for some to stop growing spiritually. The formula for salvation is repeated over and over again as if it were some sort of magic charm for luck and protection. Once the formula is accepted, the practice of religion becomes primarily the task of getting others to subscribe to and repeat this same formula. Thus we see the emphasis on evangelism. Being certain about one's salvation because there is faith that sins are forgiven lays the foundation for a happy life and a joyous self-confidence. It is difficult to fault anyone who seeks such assurance in their spiritual life. The people who seek this kind of security and the church leaders who try to provide it are sincere and honest in their efforts to create a viable religious tradition that can stand against the many challenges to religion posed by the modern world. However, there is a hidden or dark side to such an approach. When one has the ultimate answer which is distilled in this simple formula, why continue to seek and ask questions? For some, spiritual growth or the process of sanctification becomes irrelevant and unnecessary. Sanctification was a concession to the Catholics and Anglicans ("works" do matter in the spiritual life) by the Methodists, and an attempt to moderate the extreme position of the Lutherans that faith alone leads to salvation, and works play no role in the spiritual destiny of good Christians. When salvation is certain, some believe that religious practices can be put aside. Still for others, when forgiveness of sin is assured, ethics can be put aside, and this can be very dangerous. The ethical problems associated with the theology of Luther and Calvin are difficult to separate from the basic Protestant world view. Since no amount of good works can get a person into heaven, it follows that no amount of evil acts can justify keeping a person out of heaven. If all sin is forgiven, committing another sin is not such a bad thing and salvation cannot be denied to sinners regardless what sins they commit if they perform the required rituals that make them "born again". The unintended result of these theologies is "sin all you want, get forgiven, and go to heaven anyway". This approach is very good for giving hope to those sinners that are lost, have "hit bottom" and are struggling to turn their lives around. However it is clearly not a good foundation for an ethical and just society since it potentially rewards limitless and horrific evil with eternal happiness for those that perform the required ritual so that Christ can take on their sins. Violations of ethical rules are especially acceptable if the ultimate goal of the sin has a higher purpose. This "end justifies the means" type of morality has been responsible for much of the evil and suffering in the world because it sugar coats evil making it appear virtuous, and having some religious or idealistic goal. The more grandiose the goal, the greater the dishonesty and cruelty. Thus we have religious "stealth candidates" who lie about their true views running for political office and judges seeking court appointments that avoid answering questions that will give a true picture of who they are and what they think. On the extreme, we have murders of abortion doctors and destruction of government property. We also have religious leaders making claims that Christianity is a religion of war and vengeance, who advocate torture of enemies while they claim to follow Christ who told them to "love their enemies". On a more subtle level, we have clearly biased religious authorities with limited educational backgrounds making dubious pronouncements on matters of history and science. Certainly not everyone takes these approaches but some seem to be attracted to these fundamentalist traditions because of them. Modern religions that take the twin approaches of the certainty of salvation and of all sin being forgiven are seeing increased membership. The richness and beauty of religious texts become sterile and dry as monolithic interpretations are accepted by whole church councils, denominations, and congregations. Agreements arise on what and how people must believe in the name of group unity, or faith, or security, or salvation. Some protestant denominations that protested the authority of the Catholic hierarchy in the reformation so that each individual could become his own priest have now taken on different authorities in the form of church conventions or charismatic preachers who tell them the true and only interpretation of the Bible. Formerly congregational churches where the local church members decided doctrine are being pressured by interchurch hierarchies to adopt the true interpretation or be expelled. Authoritarianism is ascendent, and the individual is expected to adapt and conform to the group. Fortunately, Bible study groups, where people are sometimes encouraged to discuss differing interpretations, run counter to this trend. These group interpretations have the virtue of clarity and simplicity, and can be very helpful, but they are only a point of departure on an individual spiritual journey, and not a final destination. Those who tell people who are at the beginning of a journey that they have already reached their final destination do them a great disservice. These group interpretations also have the distinct down side of creating tendencies towards a "fortress religion" where everyone who does not believe the proper interpretation becomes a threat or an enemy or of the devil. Religious communities, which should be cohesive based on bonds of love, can shift the basis of this community to bonds of fear and hatred of the outsider. Having the correct religion combined with its correct interpretation has been the basis for many religious wars in the past, and could easily become the basis for another wave of cultural and religious wars in the future. It is the deeply symbolic nature of religious texts and imagery, and the inability of some religious people to accept the pervasive ambiguity of a religious life based on shifting meanings and interpretations that is the source of these fundamentalist revivals. In this situation, scripture becomes history and its symbolic doorways can become closed and locked. The revelatory nature of symbols requires that their meanings change in order for the symbols to function as doorways to the sacred. The literalist is continually caught in confusion trying to make clearly symbolic statements sound literal and struggling to give them only one interpretation. Another approach is to draw an imaginary line between those biblical passages considered clear or literal while ignoring passages that are obscure or mysterious. Such differentiation requires that the interpreter know where to draw the line that separates the symbolic statements from those that are clear and direct. It also means that much of the text can be ignored without losing its essential meaning. But for the vast majority who take the first approach, it is ironic that the Book of Revelation which is among the most highly symbolic books in the Bible is one of the most important texts for Christian literalists. Similarly, those who treat the Bible as a kind of divinatory text which predicts what has happened in the recent past, and what will happen from now until the rapture are on very shaky ground. The dense forest of symbolism which must be crossed to understand, for instance, who is the Antichrist, what country will produce him, and the states that will be at war during the end times is anything but literal. People who claim a literal interpretation as they wade through a sea of symbolism seem to simply have forgotten what the term literal means. For most of Christian history, the Book of Revelation was considered a historical document that described events that occurred in the first century A.D. rather than a blueprint for future events that will occur at the "end of time". The author was probably a refugee who had experienced the pillaging of Jerusalem by the Romans in 66 CE and is thought to have written this coded text as a response to the Roman army's savagery. The evil of the Roman Empire was symbolized by his various depictions of evil such as the multi-headed dragon we see in the text. The book of Revelation was very nearly not included in the original biblical canon because so many bishops and scholars objected to its contents. It was also the vision of a single individual (John of Patmos) whose history is murky and who almost certainly never met Jesus. Those who believe that John of Patmos was the same person as John the Evangelist (author of the Gospel of John) can provide little evidence to support this conclusion. Focusing the bulk of one's theology on this single text with its obscure symbolism as many apocalyptically-oriented believers do is quite a radical departure from fourteen hundred years of Christian thought and history. Christians who embrace this radical modern interpretation and call themselves conservatives seem to have forgotten what the word conservative actually means. The literalist is largely cut off from the power of sacred symbols and therefore from religious experience. This being the case, the individual turns to external authorities for guidance. Faith-based religions which rely mostly on external authorities are excellent places for the autocrats and the power hungry to gain followers because it is easy to gain the trust of those that consider faith a saving virtue. Religious language is easily learned and easily manipulated, and con artists have been using religion for centuries to swindle the unsuspecting. Since revelation exists only in the past, history becomes central and the desire to envision an ideal period of perfection that all the faithful must return to becomes very strong. The tendency to project a fantasy world (golden age) which describes an ideal religious past that must be "conserved" is a prominent feature of these fundamentalist or conservative groups. This is one reason they consider themselves to be conservatives. Without an ideal place and time to return to, there is nothing worth conserving. It may be the 1950's, the time of the Puritans in the early colonies (for Reconstructionists), the revolutionary period of the founding fathers, the time of the prophets, or the period of the early church before the canon was closed. These historical periods are often associated by individuals with their childhoods which are remembered as times of religious faith, peace, security, and order created by pious and good parents or authority figures. But whatever period is chosen (it is often left vague), the danger lies in religious leaders claiming to be historians as well as preachers, and in their claiming absolute authority in both their interpretation of history and of scripture. In doing so, they are vainly taking on the status of the prophets of the Hebrew Bible. These prophets also talked of war, enemies, the chosen people (or tribe), and the wrath of God. We should note that the term "marketing" is a somewhat harsh word that is used in the place of evangelizing. It is used because some ministers are more interested in numbers and success than following Christian doctrine or tradition. So they turn to a popular message that sells well rather than a less popular message that is more faithful to 1600 years of Christian tradition. When you will do or say anything to sell something and you measure your own worth by your sales success (the size of the congregation and the amount in the collection basket), you are a sales person selling a product and no longer a religious person spreading the "good news". Tradition is about the past and representing it as accurately as possible. To control the image of the ideal past is to control the minds of the people in the present, and this is the reason that history must be changed and manipulated by those who seek to inspire faith on one hand and gain authority over others on the other. Such activity can be justified because a false story that inspires religious faith is superior to a true story that is neutral or even worse, causes religious doubt. Without religious experience and the use of symbols that give access to it, faith is a fragile thing that must be nurtured at all costs, even at the expense of truth. The rise of "religious illiteracy" which occurred across Christian denominations during the latter part of the eighteenth century and continues today means there are few Christians who can challenge the accuracy of questionable claims, interpretations, and histories. It is therefore simple to define the world view of people who believe themselves to be religious conservatives. All that is needed is to tell them what all the good people in some idealized past believed, and they will believe the same thing. The fact that the past as described never existed is of little importance. In other words people who believe themselves to be conservative and believe in such movements as Christian Fundamentalism (1880's), Dominionism (1960's), Pentecostalism (1900), the centrality of the Book of Revelation, the Rapture, and Millennialism (1830's but popularized by the book "The Late Great Planet Earth" in the 1970's), or the importance of single issue moral laws or "Family Values" against abortion or homosexuality (1970's) are not conservative at all when looked at in the context of 1600 years of Christian history. This is because none of these doctrines or values were central or popular in 1800. Most of these doctrines or theologies did not even exist in the early 1800's. Most did not become popular until the last half of the 20th century. It is only because of the anti-intellectualism and religious illiteracy of contemporary America that conservatives can believe themselves to be conservative when they are in fact quite radical and liberal. They embrace fads and the latest craze in Christianity much like people who feel driven to buy new clothes when designers come out with latest styles and colors of dress every year. That is, these "religious conservatives" are open to believing in and promoting new religious ideas. They are, in reality, religious progressives. In addition to the acceptance of radical doctrines, we have the additional factor of false histories which sell well to modern Christians and which have become wide spread in Christian communities. For instance, many founding fathers were Unitarians or Anglicans (John Adams and Thomas Jefferson), Deists, and Masons (heretical groups), and were most influenced by the early modern and enlightenment philosophers who were suspicious of religion and its irrational elements. Jefferson created his own version of the Bible editing out the supernatural or miraculous parts while miantaining the moral and philosphical parts making him the natural enemy of evangelicals and fundamentialists both of whom put a great emphasis on biblical miracles. Deists believed that God was distant and therefore forced national leaders to depend not on him for guidance but rather on the rule of law (a written Constitution), and on self-reliance, and self-determination. Religious wars had created chaos in Europe and they hoped to avoid recreating the same situation in the new world. Six out of the first seven Presidents of the United States were Unitarians or Deists for a significant period during their lives. The first protestant belief system focuses on the unity of God and denies the Trinity which, in turn, denies the unique role of Christ as the bringer of salvation (heretical by most Christian standards). The second (Deists) believes that God created the world but left mankind on his own to run it (God is disinterested and uninvolved in humanity's salvation). None of these groups ever even heard about the Christian "born again" movement which can much later historically. In the idealized (untrue) version as described by conservatives, these same people all wanted America to be an evangelical Christian theocracy run by born again Christian leaders. As another example of false history, in the early church, the most respected church leaders were the most sophisticated in their interpretation of scripture seeing layer upon layer of symbolism. In the idealized version, these elders and scholars were only interested in simplicity and a single interpretation. In other words they were good fundamentalists and literalists who believed "every word in the Bible is true". In yet another example of a false history, the modern fundamentalists and evangelicals believe that the secular forces of government and the courts forced religion out of the schools, and that these institutions are responsible for America's increasing loss of faith. However historically, it is Protestants and Catholics who could not agree on which Bible to use in the public schools and on whether to add biblical commentaries or not to the public school curriculum. They also jointly refused efforts to teach a generic form of Christianity and Judaism that would be acceptable to a wide cross-section of the population because they characterized it as too "unitarian". Christian leaders and educators therefore voluntarily removed religion from the public school system. This removal happened more than a century before the Supreme Court stopped school prayer in their 1962 decision which so angered conservative Christian groups. In the conservative's created history, the secularists, agnostics, and atheists in and outside of government were the villains in a plot to remove religion from public education and create a godless America. This phantom enemy must therefore be opposed by Christian conservative cultural warriors. Removing Christian education entirely from the public school curriculum was many times more significant and serious than removing a single prayer at the beginning of class which was practiced in only a small minority of public schools. There is a near constant repetition in the media of conservatives claiming that atheists and secularists live without a biblical moral compass, have "relativistic" value systems, and are more immoral as a result than their religious counterparts. They say that society would be more moral if such people converted to Christianity, and crime and social ills would decrease. However, statistically conservative and bible belt states have generally higher levels of divorce, murder, unwed mothers, welfare, and abortion (as examples of immoral behavior or the lack of family values) than "less Christian" states. The degree to which bible belt and "red" states are deficient in family values and Christian morality is shocking when the statistics are examined in detail (see the Vanity Fair article Red State Babylon). Statistically, studies also show that atheists are underrepresented in prison populations as compared to their numbers in the larger population. One simple statistic that might measure family dysfunction (the divorce rate) shows that the eight states with the lowest divorce rates are (from low to high): New Jersey, Minnesota, Wisconsin, Massachusetts, New York, Pennsylvania, Maryland, and North Dakota (all northern, and mostly blue states). The eight states with the highest divorce rates are (in order) Alaska, Arkansas, Alabama, Kentucky, Oklahoma, Nevada, Mississippi, and Maine. Five out of eight states are "bible belt" or red states and these are much larger in population than the others representing about 20 million people compared to the northern states (Nevada, Maine, Alaska) which contain only 5 million. We might question who has the true "family values" from this simple set of statistics. So, to point out another false conservative narrative, it seems that areas with larger religious populations do not translate into those societies being more moral as many conservatives claim and there is some evidence that the reverse is actually true. We mention all of these radical doctrines and false histories because many of them have become a basis for making Christians feel separate, victimized, and alienated from the larger society. This feeling which is magnified by some conservative ministers then serves as a basis for the "culture war" they have declared on those who do not believe as they do. The war between good and evil thus becomes central to the conservative Christian identity, and the existence of hell becomes a necessary and important doctrine since it becomes final destination of the enemies of Christians. Without hell and eternal punishment, the whole dualistic system of war and hatred loses its eternal drama, purpose, and "ultimate concern". Its symbolism ceases to have power and meaning. That is why the largely false, folk doctrine of hell needs to be confronted, understood, and debunked. The focus on abortion dates back to the 1973 Supreme Court decision for protestants and a few decades earlier for Catholics. In other words it is very recent. One might ask how can this very modern issue became central to conservative theologians and pastors who are trying to understand how the Bible was understood in the distant past and how to spiritually return to that past. But ignoring that issue, let us note that there are 613 commandants in the Hebrew Bible (the 10 common ones are only an abridged list). But mysteriously, somehow God failed to outlaw abortion in this comprehensive list. The focus on legalism in the Hebrew Bible is indisputable and a rabbinical education is based on understanding a complex system of interpretation of the laws. It also seems clear that the people of the time knew about miscarriages, both accidental and induced. Given the focus on "thou shalt not ..." biblical laws, it seems obvious that if God wanted to outlaw abortion, it would have been a simple matter to make a commandment which forbids it (perhaps commandment 614). Since there is no such commandment, though abortion may be repugnant to many modern Christians and non-Christians, it follows that abortion is not against God's law. We might also look in the Book of Numbers at passage 5:27. Here, there is an apparent recommendation that the Jewish Priest should give a drink intended to curse any woman and abort her child who has had sexual relations with a man other than her husband, and conceived a child. Scholars may argue whether the cursed "water" is intended to physically (or psychologically) abort the fetus because of the obscure language used. What is clear is that the woman and by extension her "innocent child" will be outcasts to the community if the child is born after adultery is proven. Here God and his priests do not appear to be protective of innocent children but vindictive instead. If the cursed "water" is intended to abort the unborn child, we have an instance where God condones and prescribes abortion, and this presents a serious challenge to all the anti-abortion Christians. Exodus 21:22 says that if men cause a women to have a miscarriage, then then they must pay a sum to the parents to compensate them. In accordance with Roman Law, children are owned by the father and considered property. They are not "persons" as claimed by conservatives since the individual causing the miscarriage would be charged with murder or man slaughter rather than destruction of property if they were "persons". Here, the Bible clearly states that abortion is NOT "murder" of an unborn child. Finally, it is well documented that somewhere between 15% and 20% of pregnancies end in a miscarriage. These are in effect abortions (killing an unborn child) that women have no control over. From a Christian viewpoint, they are caused by God or a product of divine will. But Christians do not treat God as evil because he causes these abortions. If it is immoral for a women to choose to abort a child, why doesn't the same moral standard apply to God? This notion that God can do whatever evil he wishes but we must be good does not make for a consistent moral law. It makes morality relative rather than absolute (many Christians are strongly against relativistic morality). Abortion is bad based only on who causes it to happen. It is only good when God does it. This suggests that there is a good deal of moral confusion in Christianity over the issue of abortion. The claim that abortion is immoral seems false from a biblical perspective but conservative preachers continue to insist it is "in the Bible" using tortured logic and vague biblical statements that describe how God loves little children and how God knew some of his prophets while they were still in their mother's wombs (God knows everything and such statements say nothing about when the soul enters into the fetus in the womb). There are many other examples of false religious histories, false religious narratives, and dubious interpretations that sound appealing and motivate believers to adopt a fundamentalist perspective but often deny the power of symbols in the process. Is Truth the Enemy of Faith? But the fearful, and unbelieving, and the abominable, and murderers, and whoremongers, and sorcerers, and idolaters, and all liars, shall have their part in the lake which burneth with fire and brimstone: which is the second death. (Rev 21:8). Christian ethics has traditionally been among the highest most beneficial ethics that we see in the world's great religions. Its corruption is a cultural and spiritual tragedy for the West. This heralds the breakdown of society much like historians observed in ancient Rome. The harnessing of ethics for political purposes is a cancer that eats away at the foundations of a society making an ever larger set of human interactions into transactional games of dominance and profit on one hand, and pleasure and entertainment on the other. Finally, let us discuss the "virtue" of creating and promoting falsehoods. Lies can be divided into three categories (colors): Black (selfish), White (unselfish or altruistic), and Blue (altruistic but indirectly selfish because they aid one's in-group). For instance a blue lie can be justified in war since spies who lie about their identity and loyalties are aiding "our side" against an enemy. Similarly Christians or political parties who lie about abortion or climate change are helping their groups in a war against outsiders and this is a great virtue. They are using falsehoods in the service of greater ideals: defending the life of the unborn, Christian values in general and therefore salvation, or oil company profits because oil companies support candidates that, in turn, support their Christian "values". Honesty goes by the wayside when tribalism rises and survival of the tribe is threatened. Dishonesty become integral to "winning the war" for Christian values when Christians paradoxically value honesty as a Christian virtue. The same media corporations that spread lies and paranoia benefit by compromising the honesty of their consumers and audience making them complicit and more dependent on the corporations to protect the tribe by reinforcing the lies. Lies and corporate and political power create a synergy. The media consumer gains self worth and the pride of supporting the in-group by sacrificing his or her honesty and integrity. The result is a divided and morally confused nation run by corporate entities using the capital they control and populace whose integrity they compromise. When all of this questionable religious conservatism gets bound up with politics, the sincere but confused religious person will sometimes seek political office and use religious ideals to convince others to support policies motivated by ethnic, class, nationalistic, commercial, or personal ambition. Medieval history describes a long series of popes, bishops, judges, inquisitors, muftis and ayatollahs employing crusades, church courts, jihads, and pogroms to carry out war, torture, murder, and mayhem in the name of religion. Mixing politics and religion sooner or later creates a toxic brew. Those who believe the two should be mixed need to look closely at current and past theocratic governments and the injustices they promote. Religious people with political power often take on a tribal identity, and tribal societies often persecute outsiders and look upon them with distain. The positive side of tribalism is group unity, tradition, and community but the negative side is xenophobia. Negative tribalism is corrupting to religious people because it focuses their attention on their enemies instead of their ideals. To become a member of a tribe is to have one's identity partly defined by what one hates or fears. To identify with this negative aspect of tribalism is to surrender the religious life to the secular, and become truly "of the world". The often-repeated argument that criticism of political leaders "helps our enemies" is a tribal-centric argument that seeks to divide the world into us and them. The virtuous, supportive, loyal tribal members must be separated from both their external enemies and the evil traitors in their midst, and oppose them in ways ranging from moral argument to war. Jesus is clear in his dislike of tribalism as illustrated by the Good Samaritan parable (Luke 10-30). Samaritans were hated by the Jews of southern Israel but Jesus used a Samaritan (an outsider to and sometimes enemy of the Jewish tribe) to illustrate the importance of being ethical and compassionate. The Jewish priest did not help the person left for dead by the side of the road by robbers but the Samaritan did. The lesson is clear assuming we take a straight forward (non-allegorical) interpretion where the Samaritan serves as role model for Christians. Being a good Christain means being kind and helping others (whether they be tribal members or not) rather than being a respected member of one's tribe (the selfish Jewish priest). Ethics and loving one's neighbor is far more important than tribal identity, being a respected member of the church, and believing church doctrine. Sadly, it usually takes many years for those who mix politics and religion to notice the corruption and cynicism it breeds in their ranks. Eventually they discover they are not the victors but rather the losers who have sacrificed their religious ideals and values on the altar of political power and expediency on one hand, and tribalism on the other. Political leaders who claim religious authority sooner or later loose their appeal. The 92-year old evangelist Billy Graham was interviewed in Christianity Daily and excerpts of the interview were reprinted in the Washington Post in an article titled, "Billy Graham Regrets Getting Into Politics." In the interview, Reverend Graham was asked, "what he would have done differently in his life". He replied, "I ... would have steered clear of politics." by rewriting history to support a religious world view based on nationalism and the pride of being a nation "chosen by God"
by making claims about the Bible being against abortion when the concept of abortion is hardly mentioned in the Bible and is not considered a sin (although Exodus 21:22 says men who cause a women to miscarry must compensate the family for the lost child, and Numbers 5:27 says that a child who is a product of adultry should be cursed and possibly aborted by giving the mother "cursed water"). This external and highly politicized approach to religion fills the void left when direct spiritual experience is impossible, and religious symbols become signs devoid of real spiritual power. For the spiritual traveler, religion is much more than having the right beliefs, or a supportive community who all believe the same thing as you. It is about employing belief, religious ritual, and group or private contemplative practices to generate charged religious symbols which can open up deeper layers of realty so that faith matures into direct spiritual experience.